If the time has come for an addition to the feline family, introducing a new kitten to a single cat can be difficult. 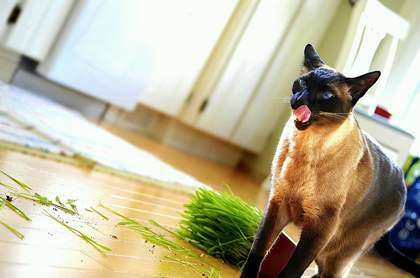 Cats are extremely territorial and often won’t easily allow a newcomer on their turf. Cats are also possessive and sharing their special person with another kitty isn’t easy. Most cats will feel that a new kitten threatens their security and domestic tranquillity won’t be immediate. A long adjustment period is to be expected. When selecting a new kitten to bring home to the family, try to choose one of the opposite genders from the current cat. Cats of different sexes tend to get along better than two cats of the same gender. The size of the kitten is also important. A small kitten may be accepted in time much easier than a larger, older kitten or young cat. To prepare the cat for the new arrival, bring home a blanket or towel that has been used as bedding for the new kitten. Or, rub the new kitten with a towel and then place the towel in the cat’s bed to let the cat become accustomed to the new smell. Bringing a new kitten home, however, can be a success if the cat owner proceeds with slow caution and consideration for the first cat. Let the cat smell the box that the new kitten arrived in. Just place it on the floor and let the cat explore it on his own. Explain to the cat that a new playmate and companion has arrived. Let the kitten explore its’ own quarters. Give extra attention to the older cat. Have extra play periods together with the cat and give plenty of tender, loving care. This helps the established cat not to feel threatened by the presence of the kitten. After a few days, bring the kitten into the same area with the cat. Be prepared to separate the cats if the older cat becomes too threatening but sit back and allow the cats to meet. The kitten will likely want to play with the cat but the cat may not be interested. Expect the cat to hiss at the new arrival. Be alert and if the cat threatens to scratch or claw the kitten, separate the pair. Put the cats together for a short period each day until they become more familiar. An older cat may try to mother a kitten or the two may become friends. Other cats may co-exist in an armed truce or survive by ignoring the others’ existence. As long as there is no open hostility, cats can thrive in the same environment even if they are not happy companions. Never bring home a new kitten during a hectic, stressful period such as the holidays. Opt for a quieter time. A long weekend is ideal to help both cats adjust to the changed situation. If at all possible, have the kitten spayed or neutered prior to bringing it into the home. Upon arrival, don’t put both cats together or attempt to force a meeting. Have a separate area prepared for the kitten with an individual litter box, water dish, and feeding dish. Try to have an area where the kitten can be away from the older cat at first. Expect a week or two to pass before the cats begin to exist in anything resembling harmony. Continue to give the first cat extra attention. Giving a favourite treat to the cat each time he or she interacts with the kitten can help make the experience more pleasant. Bring a new toy to the established cat can also help reassure that cat that they are still loved. Lots of people enjoy living with two or more cats, but each new addition must be introduced on an individual basis. With planning, caution, and care, a new kitten can be introduced to a cat and the pair can live together in peace. Some cats warm to their new family member quickly, others can take a little longer. We adopted two Tonkinese boys three weeks ago. Our domestic shorthair was fine with them from the first introduction, our Oriental boy is still upset but he is getting better by the day. You can’t rush these things, each cat is different.